LOS ANGELES, CA – 12/18/2015 (PRESS RELEASE JET) — Commercial litigation firm Tauler Smith LLP obtained a $10.2 million jury verdict on behalf of plaintiff Ahmad Alkayali against Neocell Corporation, a nutritional supplement company, and its officers and directors (“Defendants”). The dispute centered on the one-time manufacturer for Neocell Corporation, a company called Healthwise Nutraceuticals, Inc. 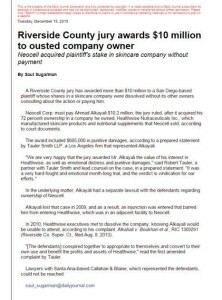 Defendants conspired to dissolve Healthwise and transfer its assets to NeoCell without informing or compensating Mr. Alkayali, despite his 72 percent interest in the company. Mr. Alkayali was awarded $9.5 million in economic and non-economic damages in connection with claims of conversion and breach of fiduciary duty, as well as punitive damages amounting to $685,000. The verdict underscores a slew of recent litigation involving nutritional supplements. Tauler Smith has pursued several bodybuilding supplement companies for false advertising and unfair competition related to ingredients in their products. Healthwise and Neocell were sister companies in adjoining rental space. Healthwise manufactured the supplements, while Neocell marketed and sold the supplements. Litigation concerning the ownership of NeoCell began in October 2008, during which Mr. Alkayali’s ownership right to NeoCell was extinguished and an injunction was issued barring him from entering the NeoCell premises, which was next door to the Healthwise facility. Although Mr. Alkayali was unable to manage the day-to-day affairs of Healthwise, he maintained his equity stake in the business. In August 2010, the defendants held a meeting where they dissolved Healthwise and transferred its assets to NeoCell, knowing that Mr. Alkayali would be unable to attend.